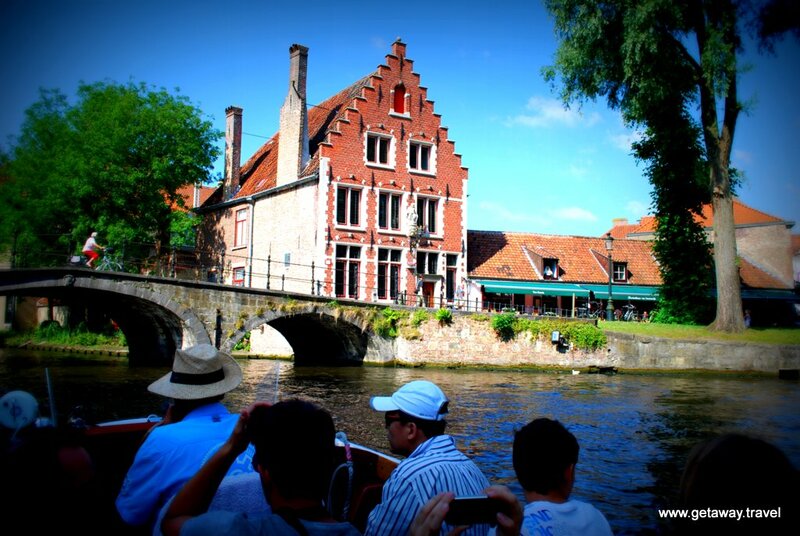 Trip planning 101 – How to take a European River Cruise from Brugge. Trip planning can be every bit as enjoyable as the trip. Our theory is some of the happiest people in the world are those who either are planning a vacation or those that are on vacation. If you are not doing one, well you should be doing the other. Here are the 3 most critical tools we used for planning a trip to Belgium. We had such a good time planning that we decided to go there ourselves. One unique way for you to add Brugge to your vacation is to take a Rhine Getaway river cruise with Viking River Cruises and add in a 3 night pre-stay in Brugge. Begin your trip on an amazing note by staying in the heart of the old town at this UNESCO World Heritage Site. See one of the few Michelangelo sculptures outside of Italy, walk along the canals, explore the cobbled streets and many sidewalk cafes. But what ever you do, don’t forget to spend some quality time at the Half Moon Brewery! After visiting Brugge, you will be transferred to Amsterdam to start your cruise on the Rhine river heading towards Basel, Switzerland. DAY 1 AMSTERDAM – Arrive in Amsterdam, then transfer to your ship. After boarding, the afternoon is yours to explore the city on your own. If your arrival schedule permits and you are interested, you may wish to visit the Anne Frank House. DAY 2 KINDERDIJK – UNESCO World Heritage Site. Sail to Kinderdijk, a UNESCO World Heritage Site, for a tour of this ingenious network of windmills and other flood management devices. You learn why the windmills were built and see how they work, plus you enter an actual working windmill for a tour of its mechanisms and living quarters. Return aboard for lunch and an enjoyable afternoon of Dutch diversions: sample handcrafted Dutch cheeses and jenever, a distilled juniper liquor, and try your hand at sjoelen (Dutch table shuffleboard). Cruise through the night. DAY 3 COLOGNE – UNESCO World Heritage Site. 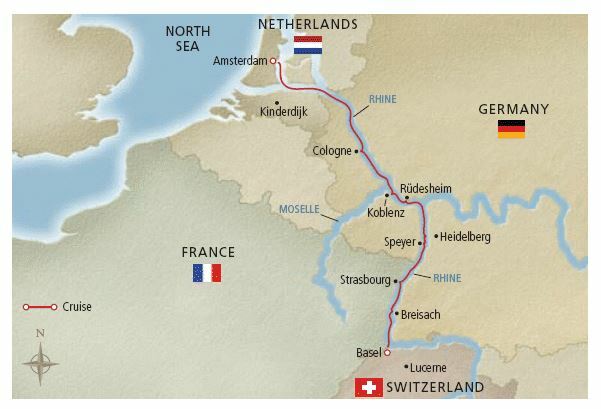 Continue along the Rhine this morning; arrive in Cologne and disembark for a walking tour. Stroll through Old Town past St. Martin’s Church, and spend some time inside Cologne’s Dom, a remarkable Gothic cathedral whose construction was begun in 1248 and which was only completed in 1880. Explore the dockside taverns, cafés and shops on your own—as always, your Program Director can help you plan your free time. Dinner is served aboard and we remain docked until late evening. DAY 4 KOBLENZ & RÜDESHEIM – UNESCO World Heritage Site. Proceed along the Rhine, disembarking to tour 700-year-old Marksburg Castle and its museum. Lunch aboard as you enjoy this scenic passage, a UNESCO World Heritage Site where castles overlook the river from their hilltop locations. Arrive in Rüdesheim in the late afternoon. Spend free time in the pedestrian-only Drosselgasse and sample a glass of locally produced wine at one of the restaurants or wine bars—dine aboard or in town if you prefer. Ship departs after midnight. DAY 5 HEIDELBERG & SPEYER – UNESCO World Heritage Site. Cruise through the morning enjoying brunch and the passing scenery. Arrive in Mannheim and disembark for a journey to Heidelberg to see Germany’s oldest university, founded in 1386. Then visit the beautiful sandstone ruins of imposing Heidelberg Castle, and take in the scenery of the Neckar River Valley and the city’s many red rooftops from its hilltop location. Continue with a walking tour through the Old Town to Heidelberg’s renowned gates. Rejoin your ship in Speyer this afternoon and take some time to look around. You dock in full view of the imposing Romanesque cathedral, a UNESCO World Heritage Site. Built in the 11th century on the site of a former basilica, the building’s design was highly influential upon Romanesque architecture for centuries to come, and is the final resting place of eight German monarchs. Its soaring interior features graceful rows of sandstone columns and a large stained-glass window installed in the western façade during a later Gothic period. DAY 6 STRASBOURG – UNESCO World Heritage Site. Dock this morning in Kehl and disembark for a guided tour of Strasbourg. See the European Parliament and tour the interior of the city’s famed cathedral. The afternoon is free to further explore this Alsatian city’s blend of French and German cultures—fabulous churches, medieval covered bridges, beautiful parks and some lovely Art Nouveau and modernist architecture. Dine aboard and enjoy free time this evening in the quaint little city of Kehl. DAY 7 BREISACH – After cruising through the night you arrive during breakfast in Breisach, gateway to the Black Forest. Take a scenic excursion through the area’s renowned mountain landscape, rolling meadows and dense forests. Once there, visit a local workshop and see a cuckoo clock-making demonstration. Return to Breisach for some free time before an early evening departure. Or, choose an optional excursion to the quaint Alsatian town of Colmar. Dine aboard while you cruise on to Basel, arriving around midnight. DAY 8 BASEL – After breakfast, disembark and proceed to the airport for your return flight. Or, extend your time in Switzerland’s Alpine region with 2 nights in lovely Lucerne or a 3-night stay at Lake Geneva. This entry was posted in Beer, Belgium, Cruising, Europe, River Cruise, River Cruising and tagged amsterdam, basel, bruge, brugge, netherlands, switzerland, trappist ale, trappistes rochefort, UNESCO World Heritage Site on February 1, 2014 by Paul - GetAway Travel Service. 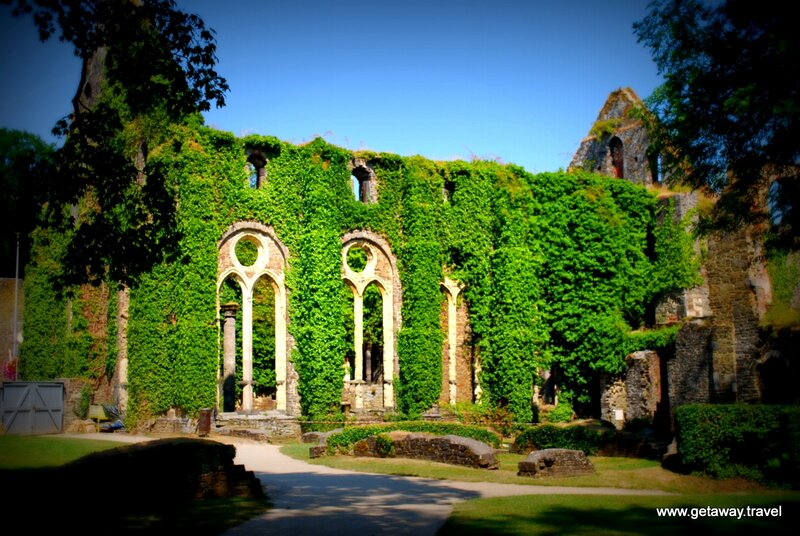 Villers Abbey (Abbaye de Villers) was founded in 1158 in what is now the province of Wallonia in Belgium. It was a Cistercian abbey which emphasized a life of manual labor and self-sufficiency. Many of these abbeys would have traditionally supported themselves with activities such as agriculture and brewing beer. Although founded in the twelfth century, most construction did not start until the early thirteenth century. The church took 70 years to build and was completed by the end of the 13th century. 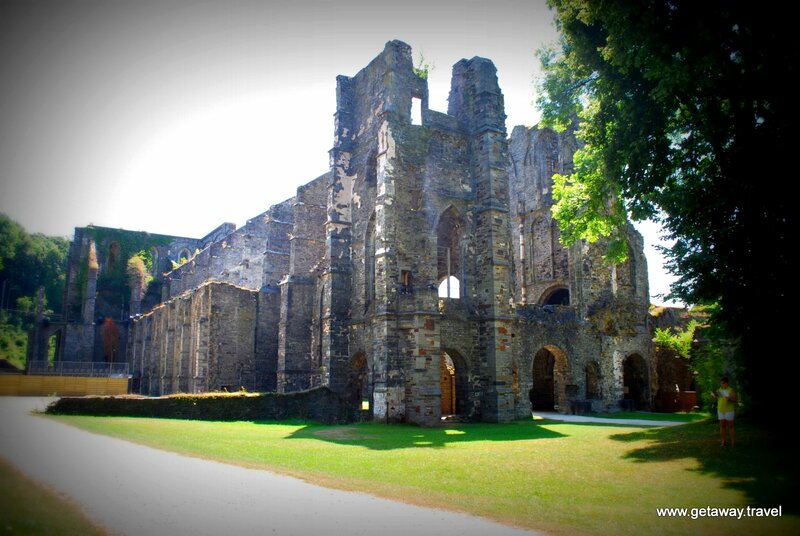 At the height of its importance, the abbey had about 100 monks and 300 lay brothers living inside its walls. Decline set in during the 16th century, due to political instability in the low countries of north-western Europe. In the 17th and 18th century , the abbey’s fortunes continued to diminish and it was finally abandoned in 1796 in the wake of the French Revolution. Now after considerable restoration it is an amazing tourist stop. The church, although in ruins, is an outstanding example of Cistercian architecture with imposing vaulting, arches and rose windows. Many thanks to our friend Greg for his vivid portrayal of a monk seeking out the brew house! This entry was posted in Beer, Belgium, Europe, Travel and tagged abbey, cistercian, monks, ruins, villers, wallonia on October 14, 2013 by Paul - GetAway Travel Service. So where do we start our Belgian beer journey? Do we head to an Abbey or Trappist monestary? Do we go in search of wild yeast Lambics? Where can we find red beer, fruit beer, spiced beer, farmhouse ale, dubbels, tripels, quadrupels? Well, you can’t really make a bad decision in this country, but as for us, we started in the northwest area of the country in the province of West Flanders. There are so many fantastic places to visit in Belgium, but certainly on the top of any list of where to go should be the city of Bruges. How special is it? Well, the entire city center of Bruges is designated as a UNESCO world heritage site. It is one of Belgium’s and Europe’s best preserved medieval cities. There is so much to see, do, eat (9 Michelin Star restaurants!) and drink that you should spend a couple days here at least as part of your Belgian beercation. powerhouse. Foreign merchants from Portugal, Gaul, England, Scotland, Venice and the middle east all set up trading in Bruges. It was the home to what is widely believed to be the worlds first stock exchange opened in 1309. Now Bruges is a picture postcard perfect tourist destination, with wonderful canals and within the historic city center, street after street of charming historic buildings. There is so much to see and do in Bruges. You may want to start by climbing the belfry to see the carillon in action. You definitely should take a boat ride on the canals. You may even want to go to the lace museum. Eventually though, you really should make your way to De Halve Maan, the only family brewery in the historical center of Bruges that is still active. Germany. They began to brew lagers and rounded out production with soft drinks as well. Henri III specialized in a home delivery service system with horse and hamper, making a point to visit every customer at least once per year. In the 1950’s Henri IV took over and helped expand the breweries home delivery service with trucks. However, in the 1970’s this was the downfall of the home delivery system as people had their own cars and started buying beer in supermarkets. In the 1980’s, interest in traditional regional Belgian beers was increasing and Veronique, the daughter of Henri IV launched a new special beer, brewed to honor the inauguration of the Saint Arnold (patron saint of brewers) statue in Bruges. It was a blond beer of high fermentation and was given an appropriate name of Straffe Hendrik (strong Henri). However, In 1998 Straffe Hendrik brewing was taken over by a different brewery, Riva NV. In 2005 Veroniques son Xavier Vanneste revived activities a the brewery through extensive rennovation and modernization. 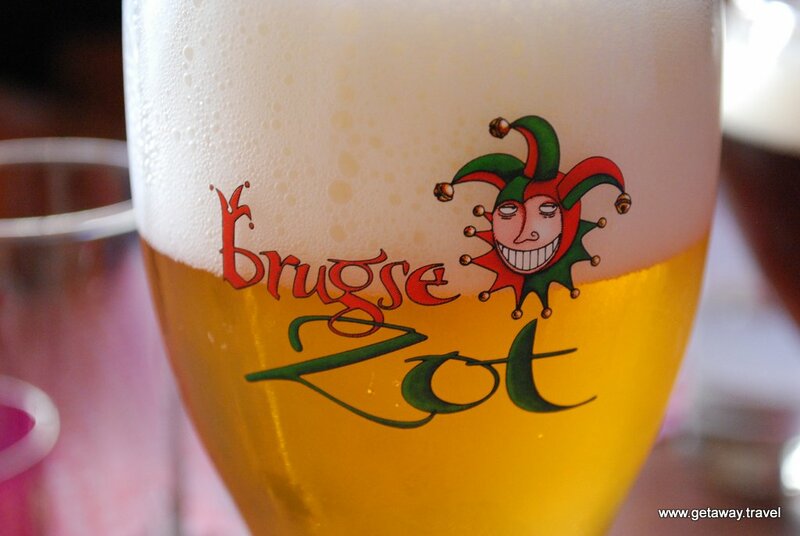 He launched a new beer “Brugse Zot”, which has been brewed with great success, garnishing many awards. 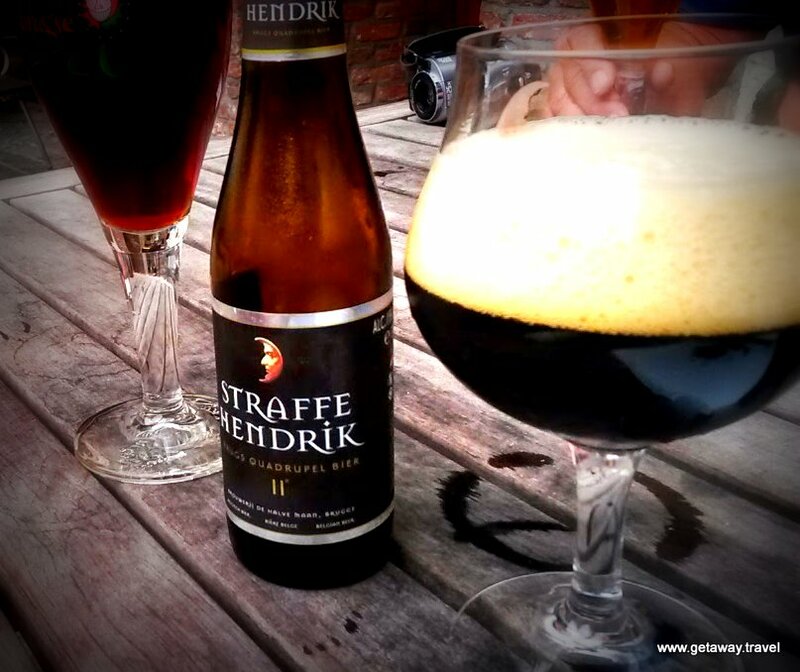 In 2008 Straffe Hendrik brewing returned once again to De Halve Maan. De Halve Maan is a rather vertically oriented brewery, so during the tour you move from the brewing room up, up and up until you are on the roof of the brewery and have a great view of city of Bruges. The old malting room and fermentation tanks are still in place (although no longer used) and make for a great combination of the modern and historical during the tour. Tours are extremely popular and a completely international affair, provided in Dutch, French, German and English! Start in the gift shop? or finish in the gift shop? This entry was posted in Beer, Belgium, Europe, Food, Travel and tagged bruges, brugge, De Halve Maan, fries, mussels, The half moon, waffles on August 26, 2013 by Paul - GetAway Travel Service. We just returned from an amazing trip to Belgium and France. We have all sorts of new stories to tell along with some great photos and videos. Our first stop in Belgium was the picture postcard perfect city of Bruges (or Brugge in Flemish). Bruges certainly has a lot to offer and we could have easily spent several days there to take it all in. But before we start posting about the town and our new favorite Belgian brewery De Halve Maan, we want to put up a quick post on lace making. Lace making? Paul did mention to Sue something about that he’d rather have a sharp stick in the eye instead of going to the lace museum — but, it is certainly fascinating to see how lace is made by hand. We hope you enjoy. 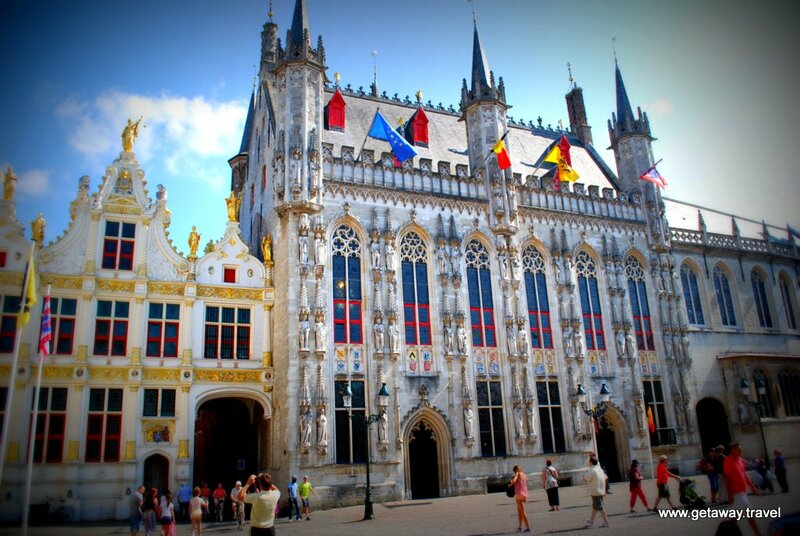 This entry was posted in Beer, Belgium, Europe, Travel, Travel Agent and tagged bruges, brugge, lace on August 6, 2013 by Paul - GetAway Travel Service. In our yard, the only greenery that ever seems to grow very well are weeds. If we want a fountain, we need to turn on the hose. For us to appreciate a garden it’s best to go visit one. The Gardens of Annevoie Castle, have been around for 250 years and they are spectacular. First opened to the public in the 1930s, the water feeding the fountains only flows with the help of gravity – no mechanical pumps. It’s a great stop if you’re touring southern Belgium where you can briefly leave the rest of the world behind before you head off in a search for that next amazing tripel. 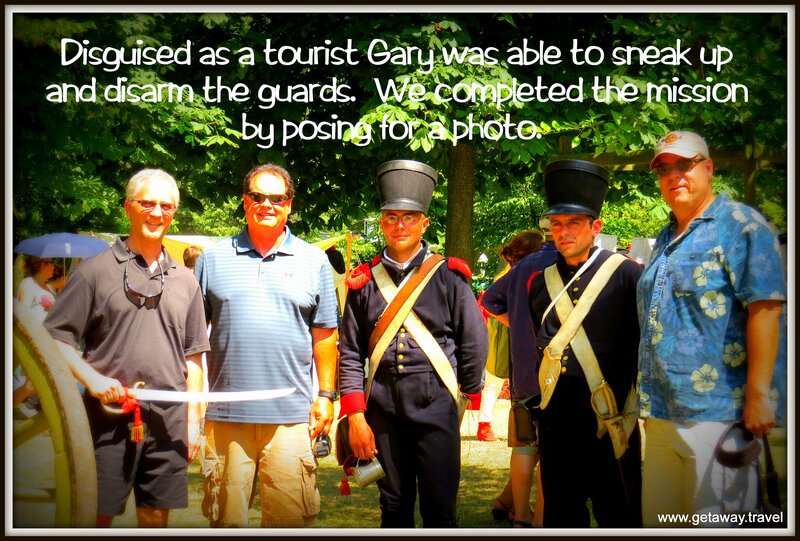 This entry was posted in Beer, Belgium, Europe and tagged gardens on July 31, 2013 by Paul - GetAway Travel Service.